← How do I download email/folder to PDF format? I get two PDF files and one image file. How to combine them into one PDF? Question:I get two PDF files and one image file. How to combine them into one PDF?I get two split PDF files and want to combine them together. Do you have any good ideas?It is best if another image (* .jpg format ) can be inserted into the combined PDF file. If not, the combined PDF is acceptable. Answer: According to your needs, please use VeryPDF PDF Split-Merge, which can help you merge PDF files easily. If you need to insert jpg to PDF, VeryPDF Image to PDF Converter can help you make it. In the following part, I will show you how to merge PDF file and how to insert image to PDF. By those two software you can create big PDF with image and existed PDF. Step 1. 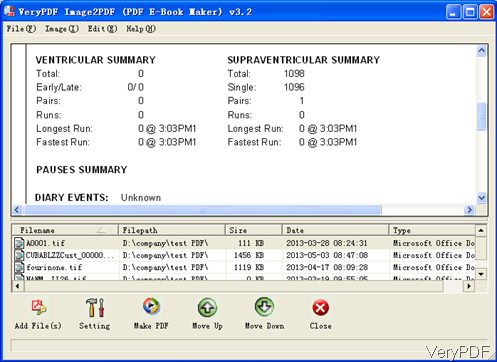 Merge PDF files. Install PDF Split-Merge. Download it and install it by double clicking the exe file in downloading folder. Once installation finishes, there will be an icon on the desktop. Simply click it then you can launch this software. The following snapshot is from the software interface. 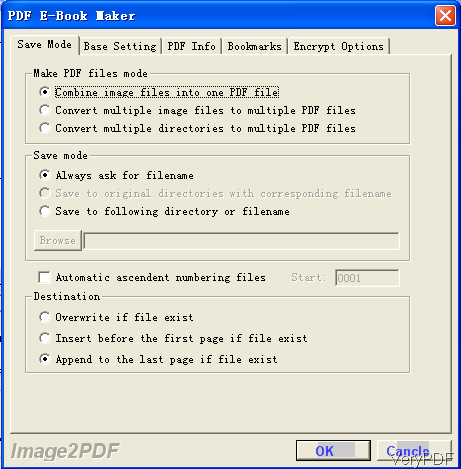 Please click Add button to add PDF file to software interface. Click button Browser to specify the output folder. And then click button Run to launch the merging process. By this method, you can merge PDF files. By Image to PDF Converter, you can insert the image to PDF either at the first page or append it to the last page. The following snapshot is from the software interface. Please drag image from its containing folder to software interface. Click added image then you can view it in the preview Window. Click button Setting then you will see the following snapshot. The following snapshot is from Save Mode tab. Here you can choose how to convert image to PDF. Please pay more attention to the bottom part, there is a Destination part, here you can choose how to insert the image to PDF. You can either insert it to the first page or the last page of the PDF. If you need to set other limitations say you can set password to protect PDF, add basic information to PDF, add bookmark and others, please go to other tabs. When you finish setting part, please click button OK to back to the main interface. In the main interface, please click button Make PDF to run the conversion. Note: all of those two software are Windows applications which can work both of 32-bit and 64-bit. If you need the Mac and Linux version, please go to our website. By those two methods, you can merge PDF files and then insert image to the merged PDF file. During the using, if you have any question, please contact us as soon as possible. Which product can work from the command line that will do both a text to pdf conversion and also split and merge? This entry was posted in PDF Split-Merge and tagged merge PDF. Bookmark the permalink.